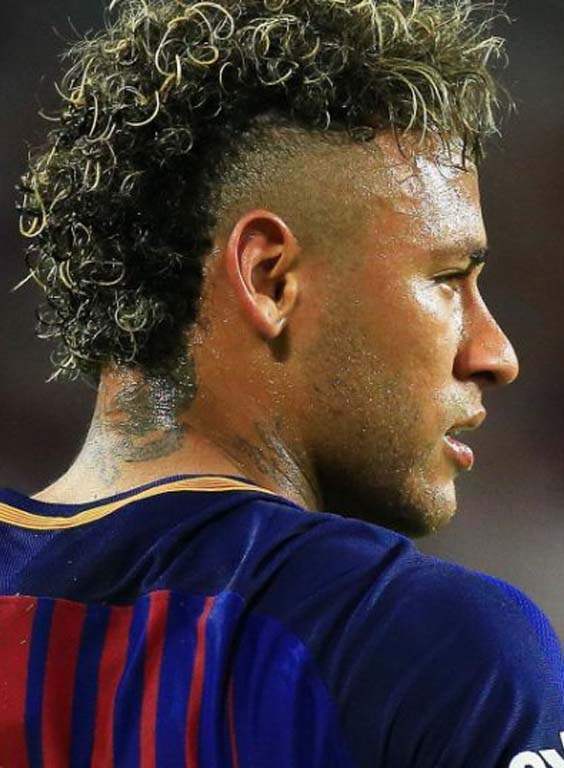 Neymar da Silva Santos Júnior, better known as Neymar, is one player whose looks you just cannot ignore when you discuss the hairstyles of famous football players. Whether or not you are a fan of his skills, you simply cannot ignore his ever-changing hairstyles. Fans around the world have copied his styles. This football star’s hairstyles seem to be evolving by the day and the best part is that he can pull off even the funkiest hairstyles with total ease. It seems that he puts as much thought into his hair as he does in his game. It also teaches you that you can go for any haircut with enough confidence to get a desired look. Neymar Haircuts are parts of the reason why he has emerged as a style icon for the youth. His haircuts and styles can really give you some amazing ideas if you also enjoy the hair styling experiments like him. The good thing about this haircut is that both pompadour and fade are trending now. For this hairstyle, grow the top middle hair long and shave off the sides completely. Style the long hair on top using oodles of hair gel for that perfect look. Finally, set the height using a wide-toothed comb and your fingers. It is one of the most popular haircuts of the famous soccer star. This one is an impeccably layered Mohawk that is jazzed up with the application of two colors in alternating manner. The base is provided by his natural dark hair color and the upper locks have been dyed in a bright blonde shade. If you have been keeping a keen eye on the changing haircuts of Neymar, you will know that he loves flaunting the fringe. In this simple but stylish haircut, he is highlighting the fringe and completely covering the forehead with it. The sides and the back are closely cropped to give him the fade haircut. You can make a seamless transition from the previous hairstyle to this one by just changing the way you style your hair. The sides of the hair are totally shaved off. The hair in the top middle portion is brushed up like spikes using hair gel and then spritz with some hair setting spray. Neymar’s love for fringes continues with this hairstyle. The soccer legend might repeat the fringe hairstyle often but he sure knows how to keep each style different from the one before. Here, his angular fringe has a dirty blonde color and it rests on the forehead while the dark color of the roots has been kept intact. This hairstyle once again proves that he can try out any hairstyle and completely own it with his charisma and charm. The back and sides have been given the much-loved fade haircut. The longer hair at the middle has been cut in layers and brushed forward. The side fringe is cut at an angle. This hairstyle is from the earlier days of his career when he used to opt for more natural hairstyles. The hair has been cut super short in this case. He has retained both the natural texture and color of his hair with just a bit of fading in length seen at both the temples. More than the haircut, what attracts you to this hairstyle is the striking platinum blonde hair color. You can definitely try out this look since the platinum and silver blonde are much in vogue now. The middle hair is longer in length and the sides are cropped very closely. This hairstyle is very easy to maintain. It is such a smart haircut that you are bound to fall in love with it. The hair has been colored in a stunning dark brown shade. The sides have been completely shaved to make the hair at the middle stand out. This longer hair is brushed sideways after puffing it up a bit. The faux hawk, also known as the faux hawk, is one of the edgiest and trendiest hairstyles that you can try out. The hairstyle has a fun and cool vibe to it which appeals to younger lot of the fans of Neymar. The hair is pulled towards the center and raised high up in spikes in here. It is the hairstyle to go for if you have such amazing natural curls in your hair. Shave off the hair near the temples and let the central portion grow out long. This will give it appearance of a Mohawk. Keep the base color dark and let the top of the curls be of blonde shade. For a star who is so experimental with his look, you can be assured that he will not stop at just a simple Mohawk. A few strands at the back have been grown out really long. These strands have been made into very thin braids that resemble the look that you see in boxing braids. Another way of ramping up the simple Mohawk is by going for dual tone in the hair coloring. The upper part of the hair is blonde while the rest of the hair is jet black. You usually see the height decrease at the back but here the height of the Mohawk rises from the front to the crown. Do you want to channel your inner tough, no-nonsense guy vibe? This hairstyle can be your best bet in the matter. Get your hairstylist to make the intricate dreadlocks in your hair and then pull the dreadlocks into a ponytail. Now, shave off the sides to make the bold dreadlocks ponytail stand out prominently. There is not much effort needed for this rather simple hairstyle and it is just full head shaved to the roots. However, this style can really come in aid to you if you suffer from the issues of hair loss, retreating hairline, or thinning of hair. Those issues will trouble you less with this particular hairstyle. The dark chocolate and platinum blonde are two of the universally flattering hair colors and when you combine these two together, you get one superb hairstyle. His favorite Mohawk hairstyle is seen here again. In this case, the natural chocolate spikes and the brilliant platinum blonde undergrowth come seamlessly together into one great hairstyle. Neymar seems to really love the platinum blonde undergrowth as he has continued with this hairstyle for the longest time. The only major changes here are that the color at the middle of the hair is a dark blonde and the hair has been brushed towards the forehead. It stops at the top of the forehead and does not cover it. There are men who are huge fans of messy hairstyles and this one is sure to catch their eyes. Another advantage about messy hair is that the hair looks thicker than it actually is. The black hued undercut is kept as you see typically. The dark brown hair is made messy to point in every direction. Can’t decide between short and long hair? Combine both by picking the mullet hairstyle. This mullet hairstyle had lost its touch as not many men were daring enough to try it. Neymar is credited to have brought it back in style. It is long at the front and back and shorter in length at the sides. Not every guy wants to go all the way with daring hair experiments. This one is for the guys who want to go slow on the path of hair makeovers. The curly hair has blonde highlights against dark roots. The curls have been messed up to bring a tousled look. Crop the sides really short. Everyone agrees that black and gold are two colors that look perfect together but anyone hardly thinks of putting these two colors together in one hairstyle. Neymar did just that when he colored his long hair in the middle in golden streaks but kept the rest of the hair natural black. Neymar shows that he can pull off a classy look with as much ease as he does with a funky haircut. This is the ideal hairstyle for both office and the after-office parties. The hair color is a subtle mix of dark brown and black. The haircut looks even more amazing with your sharp suits. 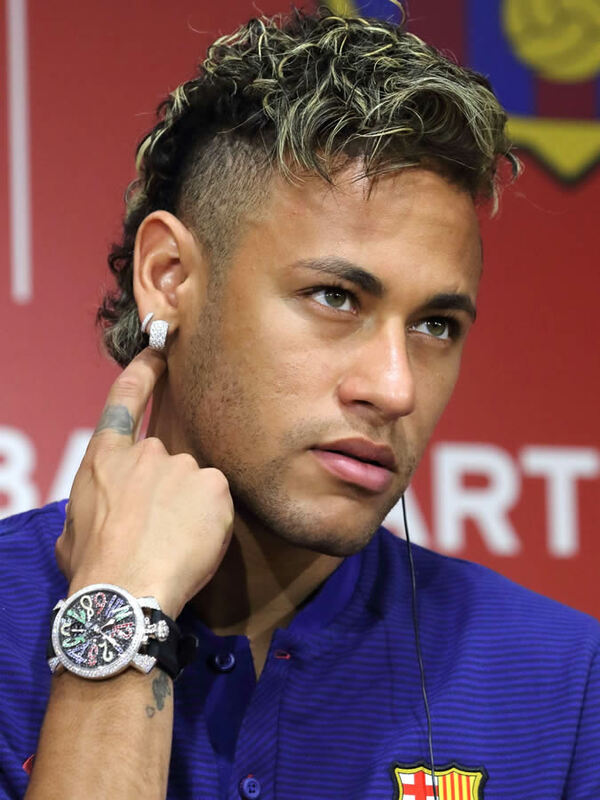 These twenty-two Neymar Haircuts cover some of the most popular styles tried out by the star. So, go ahead and be as experimental as him and try out a unique haircut every month.